A nice bar cart setup can add a certain air of sophistication to your home. But having an actual standalone bar on your property tells anyone who comes over that you are the ultimate host who may or may not throw the best parties in the neighborhood. 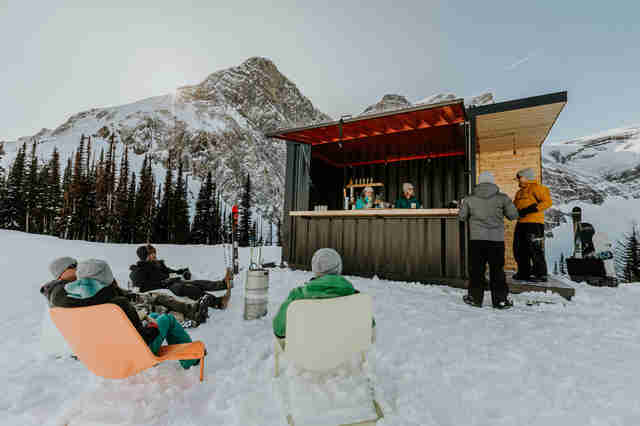 If that's the sort of vibe you're shooting for, then you'll want to get know about a little company that builds slick standalone outdoor bars out of old shipping containers and delivers them straight to your backyard, or wherever it is that you want one. 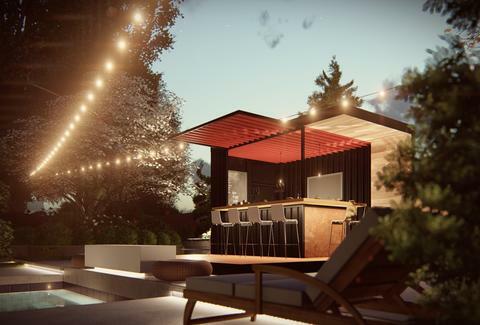 Rather than build a standalone structure from the ground up, the architectural experts at Honomobar start out with a recycled shipping container and incorporate sleek design elements and bar-standard features to transform it into the sort of backyard watering hole you'll be proud to invite people over to. Specifically, each one measures roughly 100 square feet and comes outfitted with a Canadian Fir butcher block bar top, a floating shelf, three-foot cedar overhang, and a main bar area that opens up via hydraulic lifting arms. In terms of the booze offered, keeping it stocked is on you. You can have one dropped off and set up in just about any locale you want -- poolside, by the lake, or even in the middle of the woods -- and you don't need a foundation to have it installed. The only infrastructure you need to take care of is the plumbing and electricity. Depending on your climate, you may also want to install insulation if you intend use it year-round. Otherwise, it comes equipped with an aluminum roll shutter that'll securely lock it up for the season. If you get your order in now, odds are you'll be able to get your bar up and running just in time for summer, since delivery takes just four to six weeks. However, Honomobars don't come cheap. Construction costs alone will run you a little under $20,000, and that doesn't include what you'll have to pony up in local taxes, permits, or delivery/setup costs from the company's headquarters in Canada. But, hey, can you really put a dollar amount on being the coolest neighbor on the block?